If you have any questions, please feel free to reach out!! Gorgeous sphere!!! Largest in my collection! Package was wrapped very well with extra goodies! What an amazing shopping experience! My order shipped and arrived very fast. All the different stones I purchased are absolutely gorgeous, better than the pictures for sure. As others have mentioned, you are treated like royalty and they communicate with you frequently. Will definitely purchase from Tessa and Jason again. Thanks for the gifts, what a nice touch! Some of our absolute favorite Crystal Points, all lined up and ready for our “Buddha Love” Instagram photo! Taking awesome photos of our crystals down by the water, the most peaceful thing ever!! We love to hang out with our crystal babies! So much energy and love here, they really do get treated like our own! Living from our hearts and spreading light! Each an every human on this planet is given the opportunity to find our true selves in this lifetime. Some of us ignore this and continue with the daily grind. For those of us who embrace the journey, the rewards are infinite! Hello, I'm Jason, and this is our little creation story.. Tessa and I are the proud parents of 4 awesome children, in the suburban town of League City, Texas. Our journey started when my mental health took a downward spiral and the lessons from the universe began. Fast forward a few years, and the universe blessed our life with a small amethyst geode. Tessa and I fell in love with it immediately, and of course our crystal collection started to grow.. This is when my crystal therapy began!! They began as a psychology, a way for me to learn to love myself. This "stone psychology" also lit the path to my spiritual awakening, and I took the journey to the center of my heart.. The universe clearly had more plans for us, because with this newfound loving energy Cosmic Rock Shop was born! Tessa and I have been blessed with the ability to spread love and healing energy all over this beautiful land, at a time in life when people need crystal energy the most! Everyone should be given the opportunity to make the journey to the center of their heart, just like it was given to me..
We are truly grateful and care for each stone as if it were our very own. We hang out with them, meditate with them, and I love playing the singing bowls for all of our crystals!! They all get a weekly smudging, and of course we love charging them under the full moon. 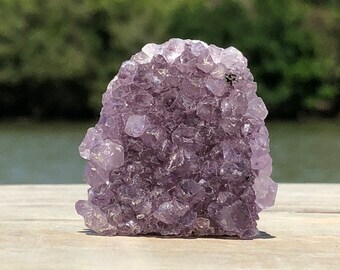 Every crystal gets smothered in awesome vibes, and sent with the highest of loving energy just like they (and you) deserve! May your life be full of infinite blessings, miracles, and awesomeness..